The Archeological Park at Castiglione di Paludi is surrounded by a containing wall with large entranceways and circular guard towers which represent one of the most interesting examples of military architecture of the great ancient Greek settlements. Of particular interest is the eastern doorway which has two towers, one on either side of the wall, with a connecting passageway which permitted the inhabitants to defend themselves from both sides of the wall. 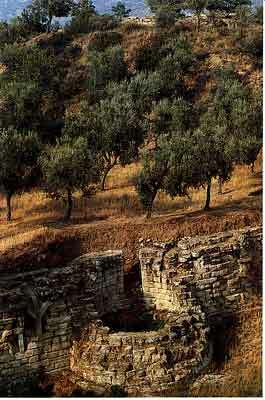 The Archeological Superintendency of Calabria has in recent years unearthed a vast ancient theatre with seats and stairsways cut directly from the surrounding rock formation, a long terraced wall under the theatre, and public and private buildings with foundation blocks and various vase fragments. 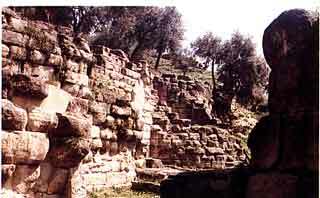 On the basis of the archeological discoveries, it has been determined that Castiglione was inhabited by the Brezi, an indigenous population which inhabited the area during the great Greek migrations of the 4th through 3rd centuries b.c. . The Brezi were profoundly influenced by the Greek culture due to commerce with the inhabitants of Thurii and Crotone, greek colonies along the Ionian sea. 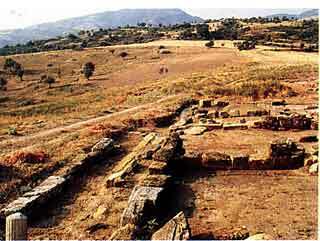 Their lifestyle at Castiglione lasted from mid 4th century to late 3rd century B.C. The disappearance of this civilization is believed to have been the result of its alliance with Hannibal during the course of the II Punic War. .